Whether you’re looking to getaway with that special someone or the entire family, Cabins in Wisconsin Dells has a destination for everyone. The Dells has cabins tucked in the woods, with a view of the Wisconsin River, or just steps away from the Dells popular attractions. Go ahead, curl up by a fire or listen to the sounds of nature on a porch swing. Cabins are a peaceful retreat from the hectic pace of everyday life. Some of our family’s most memorable vacations were in rustic cabin rentals. It just seems to be a vacation that sets itself apart from the ordinary. Cabins in Wisconsin Dells offers unique lodging options including secluded cabins, resorts, and cottages that will provide memories that will last a lifetime. Overlooking Lake Delton, is what families large and small need and want! The Reunion Magazine, November 2003 wrote a nice article on this resort because they happen to specialize in reunions. 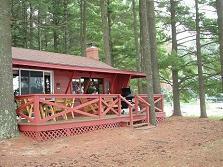 And, they are one of the very few PET FRIENDLY cabins in Wisconsin Dells. The owners purchased a little piece of paradise (5 acres) because it is the largest piece of beach front on the lake. They offer free rowboats, volleyball, horseshoes, and more. They have whirlpool, sauna and two small water slides at the pool. The beach area is huge! The sandy area goes all the way from the hotel to the private inlet cove on the lake. The family we talked to said they come back year after year and never leave the resort once they are here. They also said the sunsets are beautiful and I guess that accounts for the resort’s name! Also in the evenings you can partake in the community pit fire or just relax listen the serene waves of the lake. There is a meeting room large enough for families to meet, and is equipped with a full kitchen. This summer they offered free Riverview Park tickets with a room rental. A few other extras included fishing and even a place to clean and cook your fish! They offer a free continental breakfast, and if you log on their website, you’ll find discounts and a coupon to print. You can find them at www.sunsetbayresort.com or by calling 1-800-435-6515. They offer cottages, rooms, suites and cabins in Wisconsin Dells. *Five minutes from downtown Dells and traffic free! The Birchcliff Resort offers cabins in Wisconsin Dells nestled in the heart of Wisconsin forestry and just minutes from downtown Wisconsin Dells. They offer a great place to vacation and just unwind. You can spend the morning hiking to the Wisconsin River, the day at the outdoor pool, and gather around the campfire for a quiet evening. You might forget about heading to the water parks and just hang around a resort like Birchcliff. 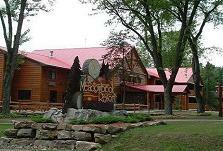 Cedar Lodge definitely offers distinctive cabins in Wisconsin Dells. Cedar Lodge is located off the beaten path in Lake Delton next to Lost Canyon on the Lower Dells of the Wisconsin Dells. It’s just minutes from all attractions in the Dells and just down the street from Lake Delton. Cedar Lodge offers several different lodging styles including spacious luxury lodges, or several additional suites and villas all with views of the Wisconsin River. Cedar Lodge is nestled in a magnificent setting of woodlands, beautiful rock formations and has 400' of sandy beach right on the river. Other water activities include a heated swimming pool and of course you can try your luck fishing right from the dock or from your boat. After a fun-filled day in the Dells you can just relax by the bonfire on the beach. We visited Christmas Mountain Village as children and again as adults. We skied the slopes as kids and swam the resort as adults during the summer. It’s still is host to numerous activities for all ages and needs! And, we enjoyed the breathtaking path you have to take to get here! It is scenic, tranquil, fun and offers a full scale of services. Some resorts with cabins in Wisconsin Dells have it all, and Christmas Mountain falls into this category. Mulligan’s Restaurant is onsite, and offers a Sunday Brunch, lunch, dinner, and even pizza delivery! Welcome to cabins in Wisconsin Dells with the look and feel of years gone by. This little piece of heaven is part of a small peninsula on Lake Delton. As we drove into the 15 acres of shaded seclusion, it was apparent that the owner of this property put a lot of thought into preserving the beauty of the land and the buildings as one. It just felt as if we were entering a different world with what seemed like thousands of tall pine trees and thick with pine needles all aver the ground. Island Point has two beach accesses, boat docks, swimming pool or in the lake, fishing, a playground and picnic area. It also has a cute clubhouse with a cabin appeal for guests to entertain in. This is the kind of place where families keep coming back year after year. We talked to a couple from Virgil Illinois who were sitting on the front porch of their cabin waiting for their children and grandchildren to arrive. They have been coming here every summer for 8 years. They rent a cabin by the beach area so kids have easy access! They even rent their place an extra day after everyone else leaves on Sunday. And no, it’s not to have a day of peace and quiet…they prepare a breakfast farewell feast for the entire family. How sweet. This is how great memories are made. This exceptional couple also gave us a tour of their darling cabin. Again, this is a no frills type of lodging. It is simple but clean and tastefully decorated. Their cabin was decorated and furnished with a Native American theme throughout…very cute. The rounded pine on the cabin walls has aged with beauty and the loft with a ladder was a nice addition and loved by the grandchildren. Some cabins are rented year round, but not all. You need not bring linens or dishes, they are equipped. The condos, homes, or cabins in Wisconsin Dells here are individually owned but rented out through a management company called Lake Pointe Management. In order to check in to your cabin at Island Pointe, you need to take a drive just up and across the road about a ½ mile or so at E11232 Hillside Drive. Call real early because this place books out for the summer very fast. Make memories with your family today at Island Pointe…I know we will! If resorting to a secluded wooded area sounds like a good idea, you will not be disappointed staying at the Meadowbrook. You will feel like you are in the north woods, but really only minutes away from the major attractions in the Dells. The Meadowbrook Resort units are all constructed with timber, very beautiful and well maintained. They offer the Tall Timber Lodge (suites), Ponderosa (like condos) and Lodge pole (penthouses), and cabins in Wisconsin Dells. Polls and water activities are suitable for all ages. Perfect facilities for reunions, weddings, business retreats, etc. they offer a reunion coordinator. Beautiful Gazebo a favorite amongst bride and grooms! Rated Best Place for family reunions by Midwest Living magazine. 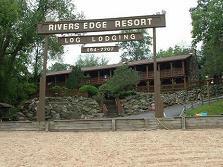 This resort is located along the scenic edges of the Wisconsin River. They offer a boat launch, sand beach, heated pool and all the relaxation you need! 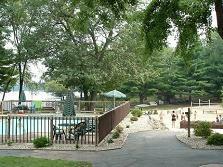 They are within minutes of all the major attractions in the Dells. 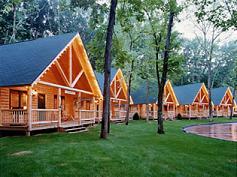 Several different types of cabins in Wisconsin Dells and lodging are available. You’ve come to the end of the road and…it’s The Sandy Beach Resort. Nestled in the tall pines and overlooking beautiful Lake Delton, resides a diamond in the rough! They have all kinds of rowboats, canoes, paddleboats available as well as a dock and plentiful fish for fishing! The resort and cabins in Wisconsin Dells are open all year round. Check out Sundara Spa Wisconsin Dells by clicking on Sundara Spa for more information. *Please call these cabins in Wisconsin Dells directly, or check their websites for updates and changes! We have supplied information with websites and toll free numbers to call the majority of these resorts.